Take your pick of spinach leaves or romaine lettuce—but by all means, be sure to dress your salad with this strawberry-apple salsa! 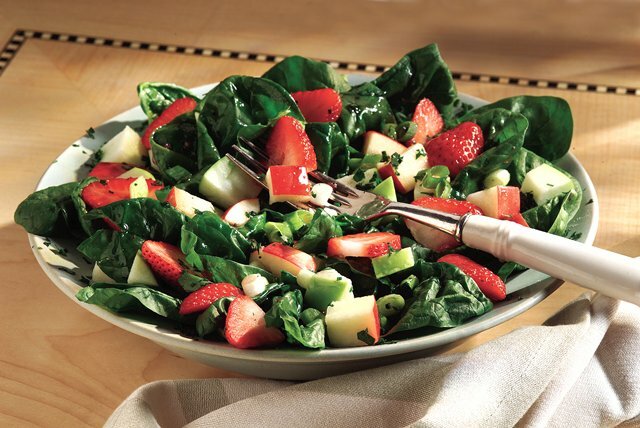 Toss strawberries with apples, onions, cilantro and dressing in large bowl. Let stand 15 min. Add spinach just before serving; mix lightly. Prepare as directed, omitting spinach. Serve strawberry mixture spooned evenly over 6 cooked boneless skinless chicken breasts. Makes 6 servings.